. Published on February 27, 2018 . When you learn to master a few simple woodworking tools, you will be amazed at the possibilities that lie ahead. You can make anything from a candlestick holder to a chair or even a bed if you want to go large. One of the cooler DIY projects involving beds uses an unlikely type of wood. That would be Bamboo, and today we’re going to show you how to make a bamboo bed from scratch with only a handful of tools and a little elbow grease. There are hundreds of bed plans on the internet and thousands of books that can guide you along as well. The first thing you need to do is make a plan; then you simply have to stick to it. 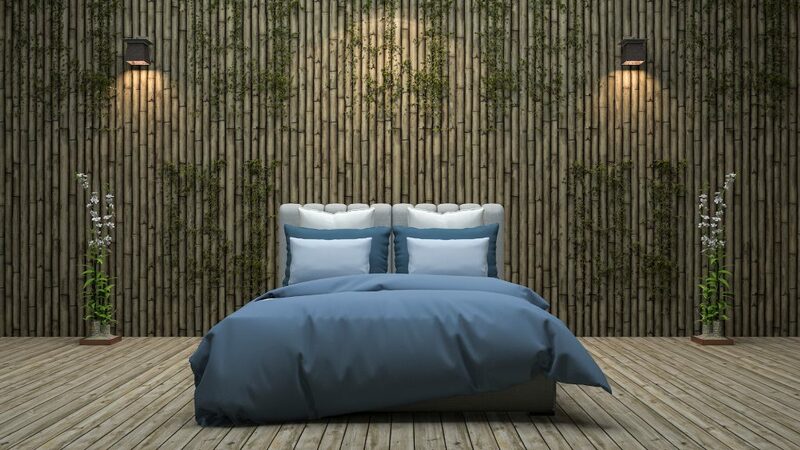 When looking for DIY Bamboo bed plans, consider your weight and just how many people may sleep in the bed as well. Do your kids like to jump on the bed while you’re in the next room? Things like that should be considered as it directly affects the way you need to build your bed. You can do the headboard and footboards anyway you choose, but you’ll need a firmer foundation if weight is a concern. Regardless of the style of bed, you plan to build; you will need a few common tools. A good drill is one of them, and you will not get far without a hole saw – we’ll tell you why shortly. A hacksaw is also ideal along with a tape measure, pencil and a pair of good snips. The sharper, the better as you’ll use these to trim up any ends. We also highly advise you to find pick up a rubber mallet. That’s one tool you may not have lying around, but it will let you hammer on the ends of your cut pieces without busting them to shreds. If you are going to cut it yourself, you will need a machete and some free time. Otherwise, you’ll want to acquire some Bamboo, but you need to pay close attention to the diameter. It’s more important than the length, as you can always use a shorter piece somewhere else, but you can’t make Bamboo wider. You’ll want to take the hole saw you planned to use and compared it to the diameter of the Bamboo. Make sure there is ample room around the cut as you don’t want to split the wood. Good, sturdy pieces are your best bet. Here is where our paths will diverge. How you build your bed entirely depends on your plan, but if you decide to keep things simple with a slot-style bed, the hard part is almost over. You won’t need to make one cut with circular saw if you use crossbars for the base. With that in mind, you need to carefully consider weight. Otherwise, you and your partner could end up in a Bamboo nightmare within a few weeks when the bottom gives out. Consider your weight along with the weight of your mattress and bedding. Building a Bamboo bed is easier than you think, and it’s a cost-effective way to get around expensive frames from the bed store. The only limiting factor is your imagination unless you’re using a set of plans featuring someone else’s design. Remember to keep safety in mind as well. Just because you’re not using a table saw doesn’t mean you don’t need to protect your eyes and hands while you hammer, drill and saw.